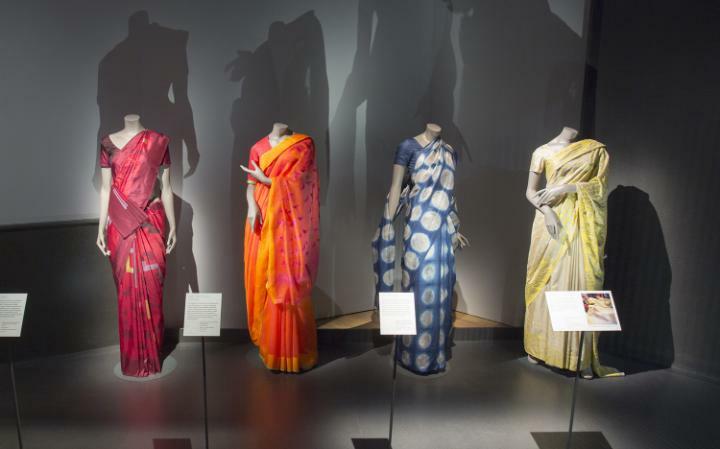 The highlight of the V&A’s India Festival, The Fabric of India will be the first major exhibition to explore the dynamic and multifaceted world of handmade textiles from India, spanning from the 3rd century to the present day. Showcasing the best of the V&A’s world-renowned collection together with masterpieces from international partners and leading designers, the exhibition will feature over 200 objects, many on display for the first time. Visitors can expect a stunning range of historic dress, heirloom fabrics, and cutting-edge fashion. I went with a friend Sam Tennakoon (whose family originates in Sri Lanka). There is a great deal to see – and while it is an expensive exhibition if you are not a member – we loved the exhibition and felt you really get your money’s worth. The exhibition starts with an explanation of Indigo dying, showing a dress, a turban and other items. Then we move on to red fabric – some of it dyed with madder, some with insects. And then a big display of yellow items – deriving their vivid hue from pomegranate skins and turmeric. There are lots of tiny, intricate tye dyes which is fascinating. The block printing (a particular interest of mine) held my attention, especially the video of how the wood blocks are made by a whole team. For a while I have been thinking about going to India to learn more about block printing. This company offers some amazing, although rather expensive, tours. I was also wowed by the embroidery on show. A shawl is embroidered with a map of the area, including trees, lakes and houses. The tent was stupendous and we sat under it for a while, imagining what it must have been like to rest inside it, in the desert, the embroidered trees making it seem like we were in a lush forest. And there were clothes too. The modern looking tie dye turban was so fresh (from the 1880s! ), and the beetle wings embroidered into a Victorian border were stunning too. There are really some amazing things to see. At the end there were some modern versions of the Sari. The blue one was tie dyed with indigo to look like moons. The lemon sari was embroidered with a running stitch to look like differently shaped pebbles. The orange sari had crows printed on it. Sam told me that Ceylonese saris are worn quite differently to Indian ones. Something I need to find out more about – maybe I can persuade her to do a blog post for us. Oooooo I will book tickets as soon as the office opens today. I love Indian fabric and I have an outfit from the 1970’s that no longer fits me but I cannot bear to part with. East Street market in East London is a cornucopia for fabric. Coooool! I’ll take a dozen. What? They’re not for sale?? I went to the exhibition a few days after it opened and really loved it. The textiles were truly beautiful and the historical context fascinating – especially the link with Indian independence about which I knew little. I was quite awestruck by the incredibly old small pieces of fabric (I think one was 300 – 400 AD?). V & A membership is so worth it – I was able to enjoy the Alexander McQueen exhibition twice at times to suit me (and take a friend) and did not mind so much that the shoe exhibition felt a little disappointing as I had effectively paid for my subscription with previous visits. Thanks for a write up of the V&A exhibition, I’ve been meaning to go, and it looks fab online. Saris are fascinating, so many different ways of draping them, and saying different things to other people as you do, and the fact that you can share them with other women who are a totally different shape to you, as there are no seams. There’s a fantastic book called The Sari (funnily enough!) by Mukulika Banerjee and Danny Miller, all about the styles, practices, experiences (anxiety and comfort) of wearing saris. I think some of it’s on Google books. A bright and happy Diwali by the way! Was gonna look and see what’s on at the V & A after Xmas as I will be visiting London then, so this was really timely. It’s on until the 10th January. Will definitely book now, thanks for sharing. This looks well worth a visit – everything is so beautiful and as for that tent! What a construction. Gorgeous! I worked for 12 years in an area of Birmingham that has a LOT of sari/suit shops, and the colourful displays in the shops ranged from the cheap and cheerful polyester saris, to the exquisitely styled, embroidered and sculpted wedding suits. I often bought ‘suit lengths’ when making bridesmaid outfits, for the bargain prices and co-ordinated fabrics. I went mooching in the posher shops for gorgeous silks. Yum. We saw a room decked out in an Indian tent when we visited a stately home…Burghley House I think, but I may well be mistaken, we visited several in the same area that holiday. It was smaller, but beautifully embroidered. Wow! I love Indian fabrics and am so happy that you wrote about this! I will not be able to be in England while the exhibit is on display, but I will definitely look for all the pictures, videos, and other sources available on the web! I have seen several fabulous clothing exhibits there over the years. I fondly remember being allowed to look through many fabrics filed in map drawers at the V&A when I was in London for several months in 1984. The V&A has had such incredible exhibits, and their staff has always been so helpful and kind to me. Sitting in that tent sounds wonderful! Thank you so much for writing about the exhibit! Lucky you Joan! It is a tremendous resource for people interested in textiles, clothes and the history of fashion. Gianni’s sister is passionate about India and has a background as an antiquarian in textiles and jewellery, so I have been lucky to see the many samples she has brought back on her yearly one-month trips to India. The workmanship is phenomenal and the styles and techniques so diverse. I know she’s planning a trip to this exhibition in London – wish I could join in! Wish you were here S. Soon, I hope. Well, here’s another reason to dream about living in London! First I missed the Sonia Delaunay show and now this. What a feast for the eye! Thanks for all the beautiful pictures. I have my invasion of my daughters flat booked after Christmas so I can visit this. She is so busy I’m not certain that she will join me but I am happy to go alone (or may offer my other place to anyone available on the day closer to the time). V&A membership is wonderful and a regular birthday gift for me! I would love to see this exhibit, I am glad you brought it to me online.